Alfred Angelo Sapphire Wedding Dresses, 2016. 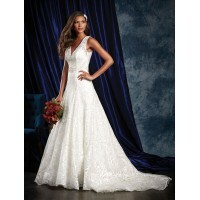 All Over Beaded Organza Fit and Flare Gown: Incredible beaded organza over satin fit and flare gown with a sweetheart neckline. The entire gown has been embellished with crystal beading, rhinestones, silver beads, and sequins. The flared skirt finishes with a chapel length train.